Beware of the potholes on Brimfield Road. Driving to Brimfield today, I hit a pot hole and thought that I would lose a wheel. 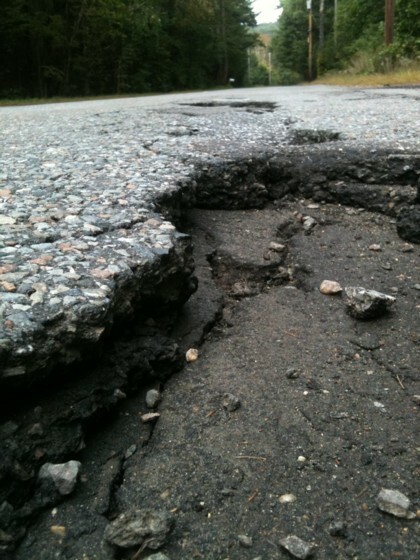 One pothole is so large and deep that it has the potential to ruin your rims if you have wheels with low profile tires. Be careful.. The pothole I’m talking about is located in the middle of the straight driving towards Brimfield before the last curve to the right before the Brimfield/ Holland line. Brian, what is it what you accomplished in the last ten years? A message from TANTASQUA SR HIGH SCHOOL. Back to School Night is tonight from 6:30-8:30 p.m. Parents can receive their student’s schedule in the main foyer from 6:15-6:30 p.m. The program will start promptly at 6:40 p.m.
Tantasqua Weekly News (TWN) recently submitted a :20 second “good morning shout out” video to a contest at WCVB Channel 5.The video was posted on their website along with several other school entries with the theme “Good Morning.” Channel 5 selected our video to air on the EyeOpener tomorrow morning (Friday) at 5:10am and 6:10am. Spread the word! The link below is the Tantasqua video as posted on the channel 5 EyeOpener website. Click here to view the video. 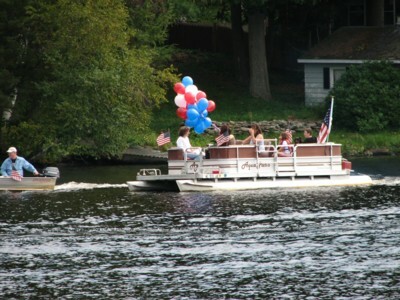 Pontoon Boat Parade in Memory of 9-11 Victims. Christine McCooe organized a pontoon boat parade to commemorate the victims of 9-11. Around 10:45 AM, about eight boat carrying flags and balloons started cruising north towards the causeway. It is hard to believe that ten years have already passed since that day. In some way or another, September 11, 2001 changed the lives of all of us. Wales Fish & Game Club 2011 Annual Pork Roast. As every year, the Wales Fish & Game Club will hold its annual Pork Roast on Saturday, September 24. I attended last year’s event and the meal was excellent. Tickets are $15.00 each at the door, $12.00 until Thursday September 22, by calling, 413 813 5593. Children 10 years of age and under are free. The meal will be served starting at 1PM. There will be a camp fire, games, and a raffle. Come and join us for a fun afternoon. You got to eat, right? Make new friends and enjoy the beautiful setting. Wales Fish & Game Club Annual Pork Roast. 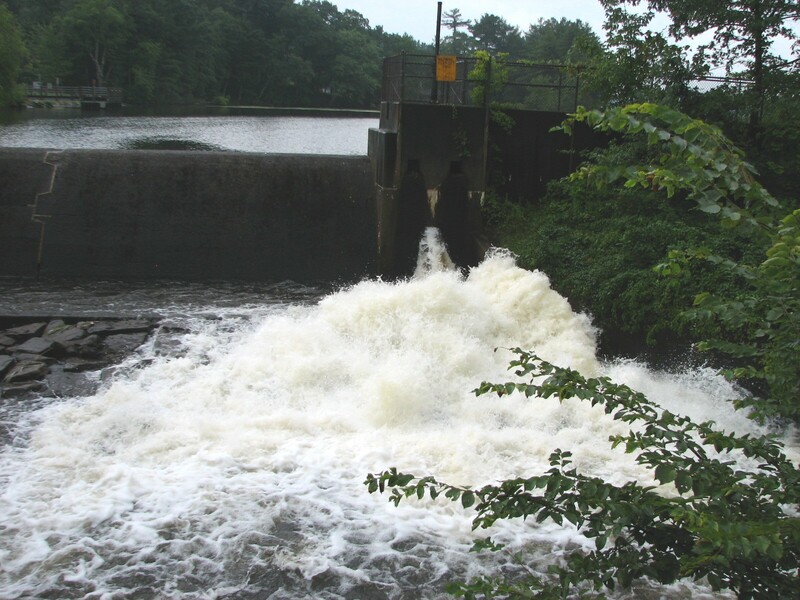 The dam has been opened in anticipation of the coming storm with perhaps 10 inches of rain. It is recommended that if you have a boat in the lake, that you pull it out at this time. Beginning Thursday afternoon in accordance with the state declaration, we [town officials] are putting into effect emergency management procedures. Shelter, a Basic Human Need; the Flood of 2005. Another Break-in at the Holland Market. I just learned that the Holland Market was again the target of a Break-In. The police is there right now to investigate. The Holland Blog reported about the previous break-in on March 8, 2009 under the heading: Holland Market burglarized twice. Break-in on 246 Stafford Road, Witnesses Sought. I'm writing in hopes you can post this or some form of it on the blog... today (august 10th) my house @ 246 stafford rd was broken into. Whoever did this had the nerve to kick my front door, steal my Toshiba laptop and an 80lb safe containing some sports collectibles and other personal items. They did this in broad daylight between the time of 10am and 3pm. By all indications just a completely random act. If anyone happened to be driving by and saw something or hears of anyone trying to pawn off a Toshiba laptop. Please contact me or the HPD. Greatly appreciate any help! Another Day in Court, Brian Johnson’s Lawyer Tani Sapirstein Filed Motion to Dismiss. Bald Eagle Sighting On Hamilton Reservoir. It was a beautiful day on the lake, about 11:00 AM, before all the powerboats come out. 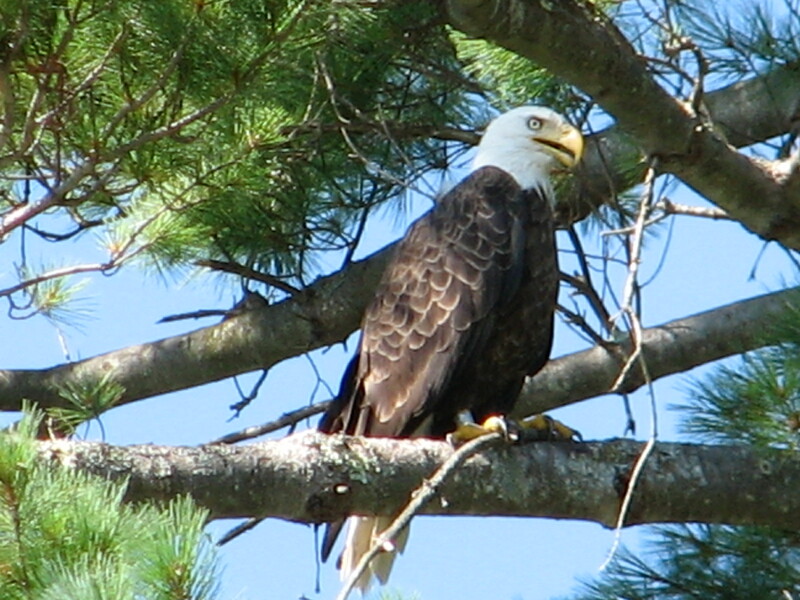 Bald Eagle spotted looking out over the old public beach area. High up in a well guarded pine tree, he looked out over the lake. Incredible bird! View is from the water as he was eye balling us as we floated on by. CHEFS sought for Rib Festival Fundraiser. My name is Deborah Williams, resident of Holland Ma, and President of a the new non-profit organization, the BACK OF THE PACK Productions, (www.botpp.org). 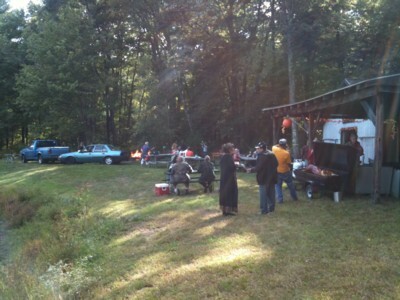 I am hosting a Rib Festival Fundraiser August 14th 3-5pm in Wales Ma at OakHaven Campground. I am in serious need of chefs to cook ribs. I was thinking posting an article on this Blog may jump-start some help? I attempted to contact the fire departments in the 13 towns our by-laws cover as well to donate their time to be “chefs” with no luck. Any suggestions!